Today, it was another museum visit yet again. But this time, it was to do mainly with non-living objects. 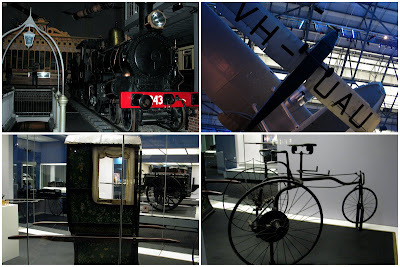 It's the Powerhouse Museum - no, not the St. James one in Singapore hor - and it's Australia's biggest museum with an eclectic collection of artefacts covering everything from history, decorative arts and music to science, technology and transport. Daddy & Mummy said that there were lots of stuff and exhibits for us children to see, touch and play, and they were right! 'Cos first up was this indoor playarea with everything related to Construction. 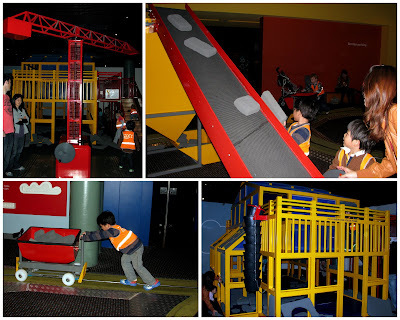 Actually it was much like the one we had encountered at the Samsung Children's Museum in Seoul, Korea. But this one is definitely much grander, with a working crane and conveyor belt. It even has wheelbarrows which we can push on a track, and it comes complete with a traffic light stop! Cool! Di-di & I definitely enjoyed ourselves there - we even made some friends too! Hee. 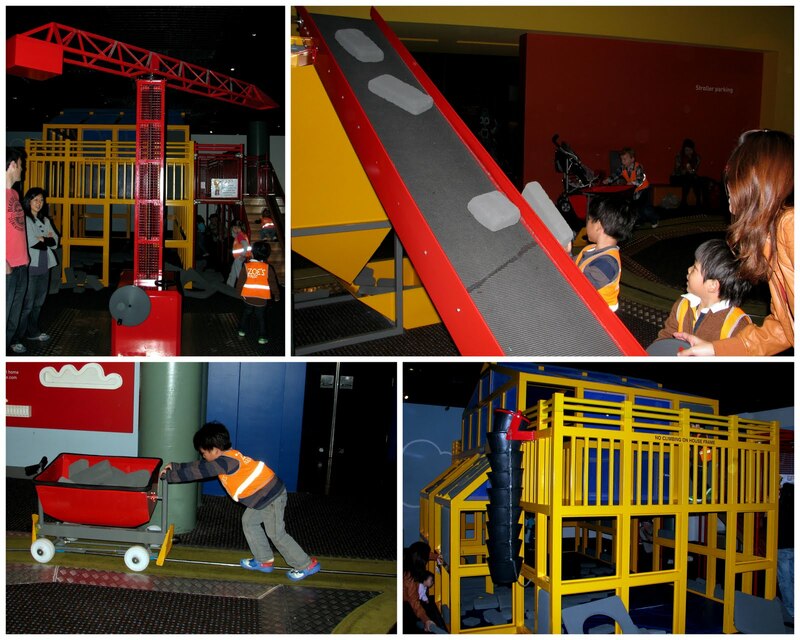 We walked around the museum after we left the playarea to look at the exhibits on display. There were lots of interesting stuff, like how steam engines worked and how they were used last time in the old days to power up machines. And I am beginning to appreciate the science of it. Don't think di-di can really appreciate it yet... but every time he feasted his eyes on an exhibit, he kept asking what that was. And I think his fave one has to be this red fire engine. Then we came to this Magic Garden where it's a multimedia interactive area to let us kids learn about healthy eating & healthy habits. We played an interactive game on the computer on good eating & sleeping habits, and even tried catching some virtual butterflies on a big screen. We cracked our heads to figure out what were the healthy food options to pack into our picnic basket. We then took a step back in time when we entered the exhibit hall which featured the transportation of yesteryear. ... where we could climb onboard and fiddle with some of the controls, like the making the whistle blow and hearing the chugging sound as the train rolled by. There was another indoor playarea for children too, but that was for younger kids so we didn't spend much time there. Ok ok, we didn't spend much time there 'cos there was another reason. I had set my sights on something else. Hee hee... no need to say much lah. Recently I have discovered a newfound love for climbing. And by climbing I really mean climbing really high. So I was pleasantly surprised to be able to put my monkie skills to good use. Daddy said the exhibition featured all stuff retro, or stuff that are related or orignated from the eighties. Like these game consoles. Oh, but at least di-di & I found something that both of us recognize! A very old & definitely limited edition Thomas! Well, this one still looks the same now! There were also retro-looking arcade machines which had games for us to play! Games like Donkey Kong, that were not familiar to us, but they sure brought back lots of memories for Daddy & Mummy! Another full day spent at the Museum once again, and once we made a brief stop at the supermarket, we headed back to our room to whip up some delicious dinner! Hungry hungry hippos... that was what we were! ... while enjoying our fruits of the day - bananas!